This month's Vampirella model is called Panda Valentine - surely not her real name. She is a cosplayer from California. She is a big fan of Marvel comics and her favourite character whom she likes to cosplay is Emma Frost of X-Men fame. That said, she has done a great job of appearing as Vampirella and I certainly consider myself one of her many fans. Moving on to hobby news and I want to chat about one of my favourite topics - Kickstarters. I know that some people hate them but I'm the opposite - I LOVE them! I know I back quite a lot of Kickstarter projects, but there are just as many (possibly more so) that I don't back. It's just impossible to back every one that takes your fancy. My top two favourite games are Zombicide and Super Dungeon Explore. I'll happily back anything to do with them. A big part of the joy of watching the launch of a new Kickstarter is seeing what new stretch goals (always free) and add-ons (optional buys) are being added. Like anyone else, I always appreciate getting stuff for free. Add-ons are a mixed bag. More often than not I'll want them and buy them, but the problem is they can quickly cost more than the initial pledge. 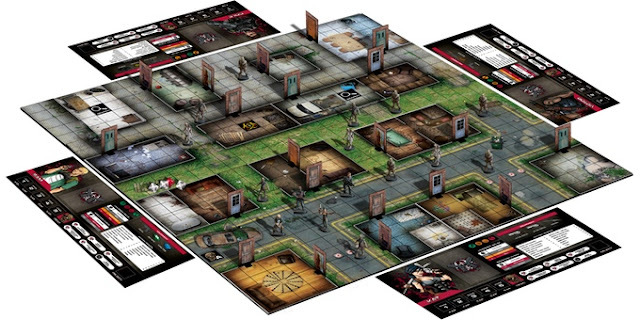 As an example, for Zombicide: Black Plague, I spent $150 on my initial pledge but $250 on add-ons. Yes, I know - OUCH! 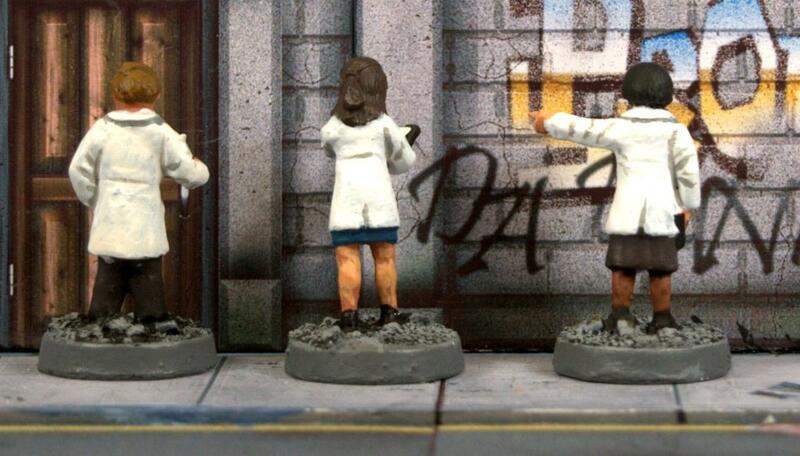 Earlier this month, the Battle Systems Urban Terrain Kickstarter drew to a close. They really pushed the boat out offering lots of stretch goals but far too many add-ons. The worst thing is, I want ALL of the add-ons but can I afford them? Most probably but it will hurt my wallet! There are a number of initial pledge levels ranging from $45 to $200. The number of pledges for $200 outnumber the rest of them added together and is the option I chose. This pledge nets me everything, and believe me, it's a lot! Legends greatly expands the original game, offering rules for campaigns and character advancement, something I have been crying out for. Soda Pop Miniatures, who produce the game have taken a very different tactic with this Kickstarter. They are offering loads and loads of free stretch goals (always good!) but best of all, there will only be one add-on produced. This gets a big thumbs up from me and I applaud their decision to keep costs down. I hope other companies will take note. I don't yet know what the add-on will be or its cost but I'm sure I'll end up buying it. I like the figures and the concept is intriguing but I can't help but compare it to Zombicide. Do I need another zombie apocalypse game? Not really. I would like it for the figures alone but I just can't afford it and so I'm passing on it. That's all for now but I would like to end by wishing everyone a very happy Halloween! Have fun! In a game like Castle Ravenloft the most common type of villain your Heroes are likely to encounter are, of course, the Undead. So far I have reviewed Vampires, Wraiths, Blazing Skeletons and Skeletons as part of the Undead in this Dungeons and Dragons board-game. Today, I turn my attention to the flesh-eating Ghouls and Zombies. 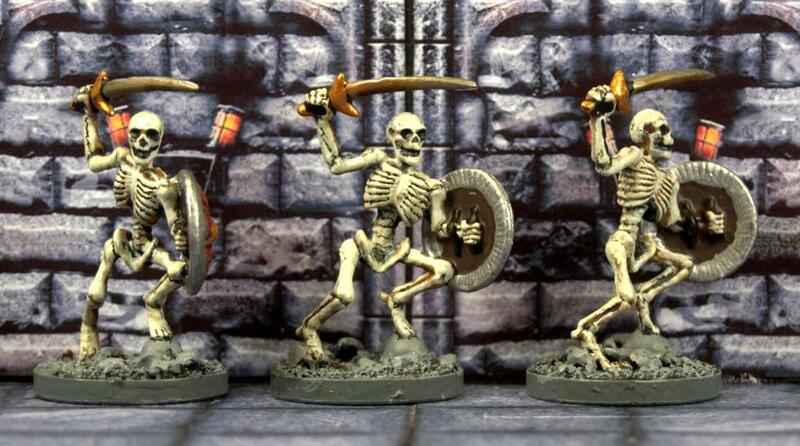 I'm almost certain these are first Ghouls I've painted in the last thirty years. I painted them in a very light grey skin tone (Foundry Austrian White 67) and gave them red eyes to help distinguish them from my zombies. They do look very similar to my zombies but are noticeably lighter in real life. The stats for a Ghoul are AC16 (very high for a monster) and 1HP. Killing one earns a Hero 2 Experience Points. If the Ghoul is adjacent to a Hero, it attacks that Hero with a rending Bite. If the Ghoul is within 1 tile of a Hero, it moves adjacent to the closest Hero and attacks with a paralysing Claw. Otherwise, the Ghoul moves 1 tile toward the closest Hero. A Bite attack gives a +9 bonus to hit and causes 3 damage. A Claw attack gives a +7 bonus to hit and causes 1 damage as well as immobilising the Hero, i.e. the Hero cannot move on his next Turn. I must admit that I am rather underwhelmed at the way the Zombies have been sculpted. They lean forward far too much and quite frankly, they pale in comparison to the way the Ghouls have been sculpted. I normally enjoy painting zombies but I admit that painting these three was a chore. The stats for a Zombie are AC11 (the lowest of any monster in the game) and 1HP. Killing one earns a Hero 1 Experience Point. If the Zombie is within 1 tile of a Hero, it moves adjacent to the closest Hero and attacks that Hero with a rotting Fist. Otherwise, the Zombie moves 1 tile toward the closest Hero. A Fist attack gives a +5 bonus to hit and causes 1 damage for each Monster on the Zombie's tile. Whilst the Zombies are meh! in terms of sculpts and stats the Ghouls are terrific and make for fearsome opponents. 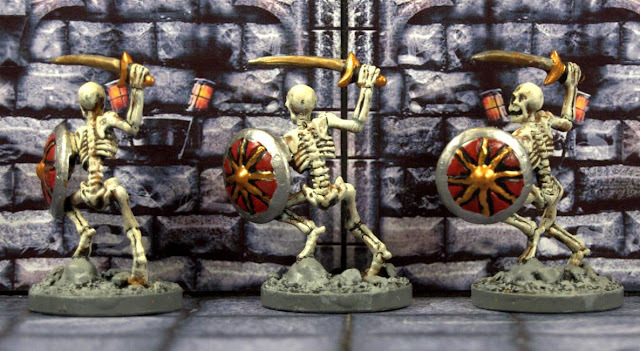 In the Castle Ravenloft board-game for 4th edition Dungeons and Dragons, there are two types of skeletons your Heroes can encounter - Blazing Skeletons and normal Skeletons. You get three figures of each type. Just like the Wraiths, which I reviewed last time, the Blazing Skeletons are made of translucent blue plastic. Once again, I was faced with the dilemma of leaving their flame effects transparent blue (to denote magical fire) and paint the actual skeleton in shades of bone, or going totally different. Well, you can see from my photos that I went totally different. The fact that the flame is literally white hot close into the skeleton added to the fact that I decided to paint the bones black, denoting a charring effect provides a stunning contrast. I'm delighted at how they have turned out. The stats for a Blazing Skeleton are AC13 and 2HP. Killing one earns your Hero 2 Experience Points. If the Blazing Skeleton is within 1 tile of a Hero, it attacks each Hero on the closest Hero's tile with a Ball of Fire. Otherwise, the Blazing Skeleton moves 1 tile toward the closest Hero. A Ball of Fire attack gives a +7 bonus to hit and causes 2 damage if it hits or 1 damage if it misses. The Skeletons shown above and below are most likely what most people imagine a fantasy skeleton to look like. Their swords are rusty, which was a deliberate decision of mine. The stats for a Skeleton are AC16 (very high for a monster) and 1HP. Killing one earns a Hero 2 Experience Points. If the Skeleton is adjacent to a Hero, it attacks with a Scimitar. If the Skeleton is within 1 tile of a Hero, it moves adjacent to the closest Hero and attacks that Hero with a charging Slice. Otherwise, the Skeleton moves 1 tile towards the closest Hero. A Scimitar attacks gives a +7 bonus to hit and causes 1 damage. A Slice attack gives a +9 bonus to hit and causes 2 damage. Two great sets of figures that I like a lot. This is the first of many reviews of the monsters found in the Dungeons and Dragons board-game of Castle Ravenloft. 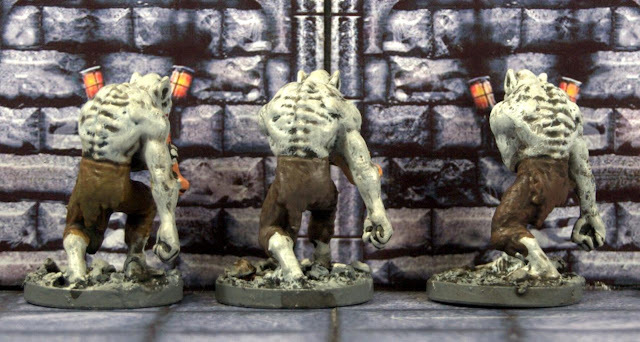 Gargoyles and Wraiths are the two most powerful types of monster you can encounter in Castle Ravenloft. For each type of monster, you get three figures, all identically sculpted. The Gargoyles look suitably menacing and are quite tall. Their stats are AC16 and 2HP. Killing one grants your character 3 Experience Points. If the Gargoyle is within 1 tile of a Hero, it moves to the closest hero's tile and attacks each Hero on the tile with a whirlwind of Claws. A Claws attack has a +8 bonus to hit and causes 2 damage plus inflicts Slowed status on the victim. If the attack misses, it still causes 1 damage. Slowed reduces a hero's Speed rating to 2. You can't tell from my paint-work that the Wraith figures were made of translucent blue plastic. I gave them a wash of Citadel Drakenhof Nightshade (dark blue) and painted the inside of the Wraiths' robes in black. The skull and hands were painted with Foundry Canvas 8B and highlighted with Foundry Canvas 8C. Wraiths are classed as Undead and they are fearsome opponents. Their stats are AC15 and 2HP. Killing one grants your Hero 3 Experience Points. If the Wraith is within 1 tile of a Hero, it moves adjacent to the closest Hero and attacks that Hero with a life-draining Claw. Otherwise, the Wraith moves 1 tile toward the closest Hero. A Claw attack gives a +6 bonus to attack and causes 3 damage if it hits or 1 damage if it misses. Wraiths have a Special Ability - Death Shriek. When this monster is destroyed each Hero on its tile takes 1 damage. These are the only two monsters in the game to grant a Hero 3 Experience Points for killing one. They are tough opponents - the Wraith, in particular can cause a lot of damage. Gargoyles are nasty if your Hero is within 1 tile of it. Move further away and they are no threat whatsoever. I like how they have been sculpted and I very nearly left the the Wraith in its translucent blue colour for its robes but in the end I went with a much darker colour scheme. It's more in keeping with my own ideas of what a Wraith should look like. 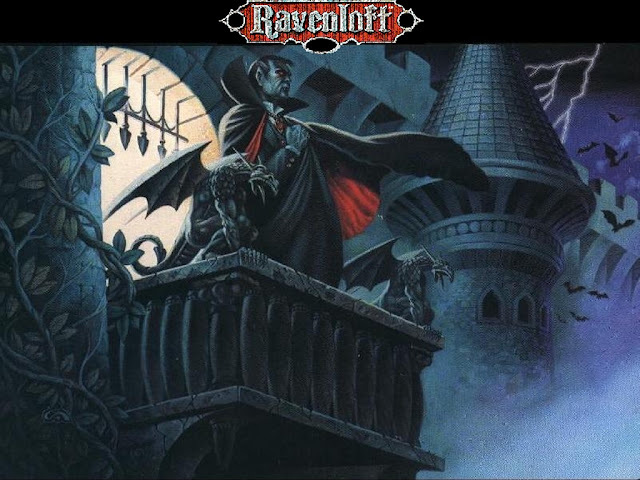 Having shown you the heroes of the Castle Ravenloft board-game last time it is now time to start my reviews of the game's monsters and villains. Villains are unique and powerful opponents, whilst monsters are low level and can appear in groups. I simply had to start at the top with the ruler of Castle Ravenloft - the vampire count, Strahd Von Zarovich. Also shown here is an unnamed Young Vampire. Wizards of the Coast, who produce this game, included the figure shown at the left of my two photos to use as both a Young Vampire and Strahd Von Zarovich, a decision which did not sit well with me. Why? Of all the figures in the game, Strahd should be the most impressive. To me, their vampire is the worst-looking figure in the set. He looks like a young policeman directing traffic and nothing at all like the mighty Strahd. So I found a replacement figure to use as Strahd (see below for full details). 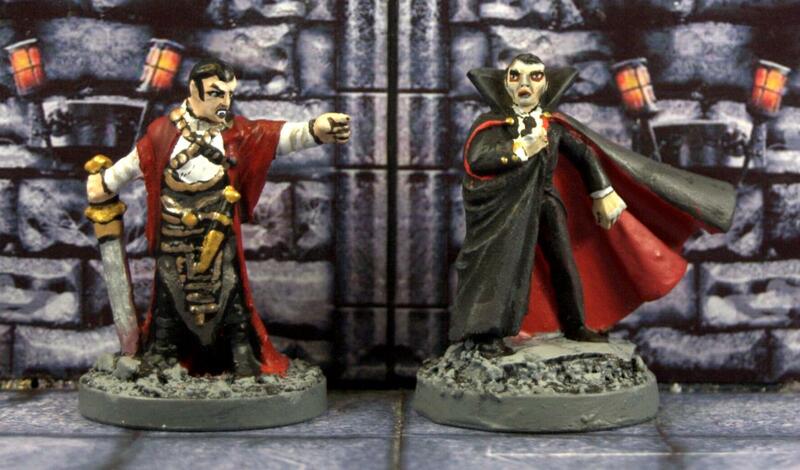 I'm perfectly happy to use the WotC figure as Strahd's Young Vampire lackey, but no way will I use him as Strahd. The Young Vampire is a Level 5 villain. Villains and monsters only have two stats - Armour Class (AC) and Hit Points (HP). The Young Vampire has AC16 and 8HP. Villains and monsters move and attack according to one of a number of tactics listed on their cards. Each possible maneuver for a monster or villain starts with a statement. If the statement is true follow the tactics listed. Otherwise, go on to the next statement. The final entry in the list will be the default action if nothing else is true. To show this in more detail here are the tactics for the Young Vampire. The Young Vampire activates at the start of each Villain Phase. If the Young Vampire is adjacent to a Hero, it attacks that Hero with Fangs. If the Young Vampire is within 1 tile of two or more Heroes, it attacks each hero within 1 tile of it with a hypnotic Gaze. If the Young Vampire is on a Start tile, the active Hero takes 1 damage. Otherwise, the Young vampire moves 1 tile in the direction of the tile's arrow. A Fangs attack gives the Young Vampire a +8 bonus to hit on 1d20 and causes 2 damage. In addition, the Young Vampire regains 1HP and moves 1 tile in the direction of the tile's arrow. A hypnotic Gaze attack gives the Young Vampire a +6 bonus to hit and causes 2 damage. In addition, place the Hero attacked 1 tile deeper into the dungeon. 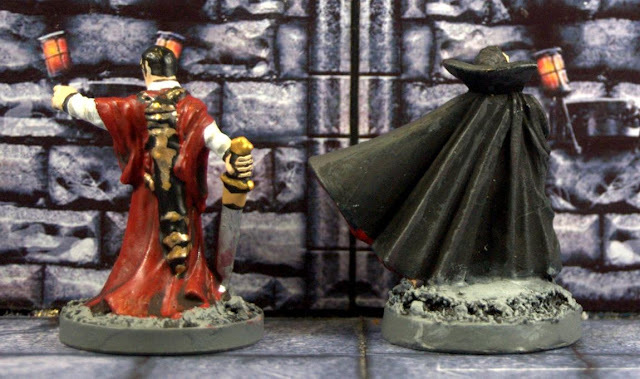 The figure of Strahd Von Zarovich that I chose is an old Ral Partha 28mm scale figure of Strahd himself from the boxed set of Castle Ravenloft figures that were produced for the Castle Ravenloft role-playing game way back in the early 1990's. I was a big fan of that game and I collected nearly all of the figures that Ral Partha produced for it. This figure looks exactly like Strahd and so is far more appropriate for use than the uninspiring Young Vampire figure. A man of noble birth, Strahd spent much of his life serving causes of goodness and law, most notably as a warrior and leader of armies. Years of such service took their toll upon him however, and by the time he reached middle age, Strahd came to believe he had squandered his life and his youth. With this dark mood upon him, he came to conquer the region known as Barovia, and assumed lord-ship there, taking as his residence the pre-existing castle known as Ravenloft. From this position of power and security, he called for members of his family "long unseated from their ancestral thrones" to join him, including a younger brother named Sergei. Some time after this reunion, the Count himself fell in love with a young Barovian woman, Tatyana, though she rejected his affections in favour of the younger Sergei. Filled with despair and jealousy, and brooding a growing hatred for Sergei, Strahd sought magical means to restore his youth. In a moment of desperate frustration, he "made a pact with death - a pact of blood." On the day of Sergei and Tatyana's wedding, Strahd murdered his brother and pursued the grieving Tatyana until she flung herself from the walls of Ravenloft. Strahd himself was shot down by the arrows of the castle guard. Even so, he did not die, but went on to rule the land of Barovia as a vampire. The master of Castle Ravenloft is known as "the Devil" to the villagers of Barovia. Strahd is one of the two most powerful villains in this game (the other being Gravestorm the Dracolich) and his stats reflect this. He is a Level 6 villain with AC19 and 12HP. In D&D terms he is classed as being an Ancient Vampire, having lived as a vampire for 400-499 years. As well as being a skilled warrior he is also a master necromancer. As you would expect from so powerful a villain, he has more tactics to choose from (five in all) than any other villain. I shan't list them all but he has two possible attacks - Bite and Magical Ball of Fire. Bite grants him a +8 bonus to hit and does 2 damage. In addition, Strahd regains 1HP. Magical Ball of Fire also grants him a +8 bonus to hit and does 2 damage if it hits or 1 damage if it misses. This painting of Strahd by Clyde Caldwell for the Castle Ravenloft RPG clearly influenced the sculptor of the Ral Partha figure I'm using. THAT is how Strahd Von Zarovich should look like! Sadly, the figure is long out of production. Not so long ago I bought the Dungeons and Dragons board-game, Castle Ravenloft produced by Wizards of the Coast. It is designed for 1 - 5 players, where the players control one or more adventurers. Villains and monsters are controlled by the game mechanics. There are five adventurers to use in the game. All five adventurers have four game stats - Armour Class (AC), Hit Points (HP), Speed and Surge Value. AC determines how hard they are to hit. If a monster rolls equal to or higher than the character's AC they will wound that character. Rolls are made on 1d20. HP determines how much damage a character can take before being knocked out. Speed denotes how many squares on the game board a character may move in a single turn (diagonal movement is allowed). Surge Value denotes how many HP a character may recover if they use a Surge Token when knocked out. Surge Tokens are shared by the party so anyone can use them but they are rare. It is recommended that a party start with just two Tokens for the whole party. The adventurers start with 4 - 5 special Powers, chosen from a list of 10, to aid them in their quest. Allisa starts with 4, whilst the rest start with 5. All Heroes start at 1st Level and may advance to 2nd Level if they roll a natural 20 on 1d20 when attacking a monster, providing they have a minimum of 5 Experience Points to spend. Experience is gained by defeating the dungeon monsters. When a Hero reaches 2nd Level they increase their AC by 1, their HP by 2 and their Surge Value by 1HP. In addition, if they roll a natural 20 when attacking they deal +1 damage. At the far left of my two photos is Arjhan, a Dragon-born Fighter. He is a mighty warrior, born to a clan of draconic humanoids. He has never lost a battle and has come to drive evil out of the ruins of Castle Ravenloft. His stats are AC17, HP10, Speed 5 and Surge Value 5HP, making him the most powerful of the Heroes. He has the special ability, Defender. When another Hero is on the same tile as him, he or she gains a +1 bonus to AC. Standing next to him is Thorgrim, a Dwarf Cleric. He is a champion of the dwarven gods, sent to eradicate the evil deep inside Castle Ravenloft. His stats are AC16, HP8, Speed 5 and Surge Value 4HP. He has the special ability, Aid. At the end of his Hero Phase, if he did not attack, one other Hero on his tile regains 1HP. In the centre of the group is Allisa, a Human Ranger. She is a master of bow and blade with keen senses and dungeon skills. She is determined to stop the evil of Castle Ravenloft. Her stats are AC15, HP8, Speed 6 and Surge Value 4HP. She has the special ability Scout. During her Exploration Phase, she can explore one unexplored edge on her tile even if she is not adjacent to it. Fourth in line is Kat, a Human Rogue. She is stealthy and sneaky and a master of sudden strikes and quick escapes. She laughs at danger and has come to Castle Ravenloft to satisfy her curiosity and acquire treasure. Her stats are AC14, HP8, Speed 6 and Surge Value 4HP. She has the special ability Trap Expert. She gains a +5 bonus to rolls to disable traps. Traps are always disabled on a result of 10+ on 1d20. Last in line is Immeril, an Eladrin Wizard. He is a powerful spell-caster from the magical lands of the Feywild. He seeks arcane knowledge and magical treasure from the ruins of Castle Ravenloft. His stats are AC14, HP6, Speed 6 and Surge Value 3HP, making him the weakest member of the party, statwise. He has the special ability Lore. While another Hero is on the same tile as him, he or she gains a +1 bonus to attack rolls. Arjhan He is my least favourite hero. I have nothing against the sculpt of the figure - it is the concept of the character that I dislike so much. To me, a Dragon-born Fighter seems like it has been designed by a Munchkin for a Munchkin player... and I HATE Munchkin players! They are just a pain in the arse, as I know from personal experience. He even comes with the Dragon's Breath Power, which is totally Munchkin! It is for this reason that he gets left out of any party of four or less that I choose. Thorgrim I have nothing against him, either as a sculpted figure or character concept. Although he is a Cleric he is powerful enough to make a worthy stand-in for the Dragon-born Fighter. He is a good solid Dwarf and his healing ability makes him a must-have choice. Allisa My favourite character from this group. I love the way she has been sculpted and her pose is spot on. My only criticism of her is that she is not armed with a bow, but that is only a minor criticism. Kat Exactly what you'd expect from a Rogue. Another great sculpt. I do have a soft spot for strong female characters. In case you're wondering what she's throwing from her right hand, it's a dart. It was a no-brainer to paint her all in black. Immeril I had never heard of the Eladrin before. He looks very Elvish, so I presume the Eladrin are a race of Elves. He is fragile in combat but he comes with some powerful spells that can prove decisive. I have no strong feelings about him. As with the others, he is well sculpted, and I do like that fireball he's about to cast. All in all, a good selection of Heroes, although I'd happily swap the Dragon-born Fighter for a Fighter from another race. I recently showed you a WIP post of my two wrecked trucks that I received last month from Black Cat Bases after ordering them way back in February 2014. Well, in addition to the resin trucks, I also received three 28mm scale scientist figures as part of my order. They got painted very quickly and here they are. The male scientist at the far left is carrying a clipboard in his right hand and has his left hand stuffed inside his lab coat. I do like that his glasses are perched on top of his head. That's not something you see very often. I have to wear glasses for reading and figure painting and it is something I've done myself many times. The female scientist in the centre of the group is rather amusingly described as "Young Female Scientist with Cleavage" on the BCB website. She's consulting an electronic notebook. I have not named any of my scientists yet, but this figure very much reminds me of Winifred "Fred" Burkle (as played by Amy Acker) in series 5 of the TV series, Angel. This was the final series, where Team Angel took over the Wolfram & Hart's Los Angeles law firm and Fred was appointed head of their Science Division. 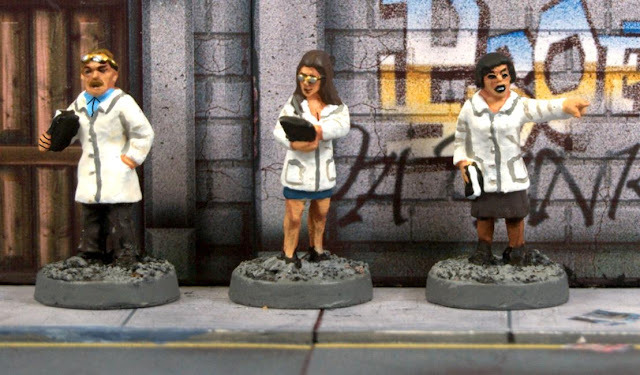 The female scientist at the far right holds a book in her right hand and is pointing with her left hand. It is a simple but effective sculpt. These three figures join my growing collection of scientists. They are all very nicely sculpted and very reasonably priced at £2.00 each or all three for £5.00. You'll find them in the Medical/Asylum & Scientists section of BCB's webstore. I'm pleased to announce that normal service has been resumed at BCB and they are accepting new orders and have sent out all of their outstanding orders. Amy Acker as Winifred "Fred" Burkle dissects a male cadaver in the TV series Angel. Fred was without doubt, the most intelligent member of Team Angel. Whilst not a skilled fighter, she was brave, smart, clever and loved by everyone, including me. Fred with her glasses, which she sometimes wore, showing a remarkable similarity with the young female scientist figure reviewed here. Earlier this year I was lucky enough to win a blog competition run by my good friend, Christopher Sheets. The prize was three Antediluvian Miniatures 28mm scale Adventurers. This was a set I was very much interested in and so was delighted to receive them. At the far left is Professor Cushion (a pun on actor Peter Cushing's name). However, I have named him Dr. Abner Perry, which was the name of the character Peter played in the film, At the Earth's Core. Perry is a Victorian scientist, who along with his American financier, David Innes (see below) make a test run of their Iron Mole drilling machine in a Welsh mountain, but end up in a strange underground labyrinth ruled by a species of giant telepathic flying reptiles, the Mahars, and full of prehistoric monsters and cavemen. They are captured by the Mahars, who keep primitive humans as their slaves through mind control. David falls for the beautiful slave girl Princess Dia but when she is chosen as a sacrificial victim in the Mahar city, David and Perry must rally the surviving human slaves to rebel and not only save her but also win their freedom. In the centre of the group is Raquel Scotch (another awful pun on actress Raquel Welch's name). Seeing as Antediluvian Miniatures made two of the main cast members from At the Earth's Core I was a little surprised that they didn't sculpt a figure of Princess Dia (played by Caroline Munro). Instead, we have the heroine, Loana the Fair One, a member of the prehistoric Shell Tribe of fishermen and women from the film, One Million Years B.C. From a marketing point of view Loana is a much more famous and recognisable character. Finally, is Shug McClure (yet another horrid pun, this time on the name of actor Doug McClure). I named him after his character's name, David Innes, from the film, At the Earth's Core. These three figures came with stat cards for the game, Pulp Alley, which I do not own. Shug is a Leader and the other two are his Sidekicks. Clearly I won't be using them in Pulp Alley (it's not on my shopping list) but I can find other uses for them. They are beautifully sculpted and their faces are recognisable as the characters they are meant to represent. The figures cost £4.00 each or you can buy all three for £10.00. Look out for my review of the dinosaurs from this range coming very soon. First up are two dinosaurs made by Antediluvian Miniatures. At the left is an Iguanodon and at the right is a Megalosaurus. Their bodies and heads are made of resin and their legs are made of metal. I pinned and glued the legs in place and used Milliput to smooth out the joints. I have already painted the three adventurers from this range and I plan on reviewing them very soon. Next are two wrecked vehicles made by Black Cat Bases. At the left is a Large Wrecked Truck and at the right is a Small Wrecked Truck. I ordered these models in February of 2014. Despite numerous e-mails to BCB asking when they would be delivered I never received a reply. Then, right out of the blue, they arrived last month. I was gob-smacked. I'd given up all hope of ever getting them but better late than never, huh? I'm pleased because they are such nice scenery items. Finally, are three large monsters from the Dungeons and Dragons board-game, Castle Ravenloft. From left to right are a Flesh Golem, Gravestorm the Dracolich and a Zombie Dragon. These figures are made of plastic and come pre-assembled but unpainted. 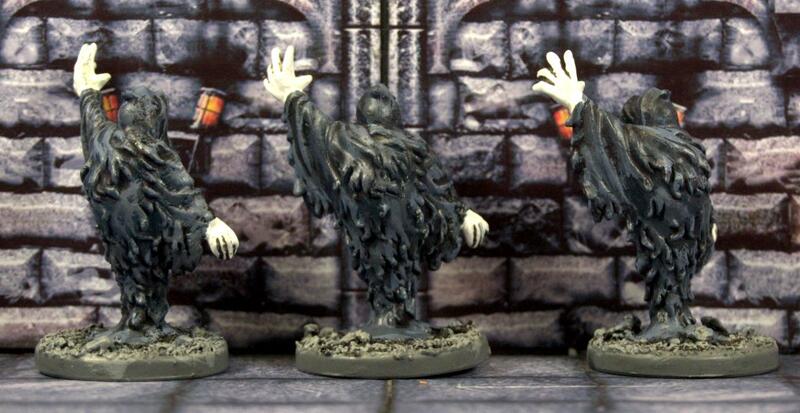 They are the last three figures that I need to paint for this game, so you can expect to see lots of Castle Ravenloft figure reviews over the next month and beyond. I expect to finish painting all seven within the next week. Then I'll move on to finishing painting my Berserker Zombies for Zombicide.